Welp. That was that. We knew it was coming but, even then, we weren’t prepared for Rick’s final episode in The Walking Dead season 9. 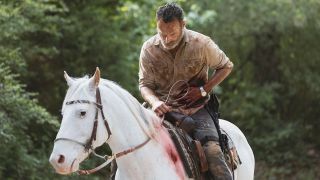 There were plenty of shocks along the way which means, yes, there are spoilers aplenty down below for The Walking Dead season 9, episode 5. Everything from familiar faces coming back to a couple of big goodbyes (and, yep, that helicopter) is about to be covered. The internet had… mixed feelings. And lots and lots of emotions. Like so many people predicted, Jadis/Anna was there to save the day with her helicopter ex machina. She somehow pulled Rick out of his predicament and is accompanying him to some place far away. It’s a bit too convenient – and you’ll give yourself a headache if you think about it too much – but at least it keeps the plot moving while Rick is off doing his own thing. Hershel! Shane! Sasha! Sure, a few of the old guard were notably absent (where was Carl and Lori?!) but these fleeting moments were high points in an episode filled with them. It was especially heartbreaking to see Rick say farewell to Hershel after actor Scott Wilson sadly passed away in October. But, wait, Maggie's gone too?! It’s been swept under the rug a little, but Lauren Cohan isn’t returning as Maggie for the entirety of The Walking Dead season 9 – and possibly beyond that. Still, while she didn’t get an obvious sendoff, Maggie’s electric scene with Negan was about as good as the show gets, so she’ll always have that. And then there’s the time jump. Phew. This was the episode you chose to last 44 minutes, AMC? Judith looks like a badass and, in fact, so does everyone else. And it sets up the show nicely for a Rick-less future. What’s next? Don't be sad, there's still plenty to look forward to. There's a whole bunch of new TV shows to keep tabs on, for one thing.